Dust in themartian atmosphere has settled slightly, allowing more sunlight to reach thesolar panels of NASA's power-starved rovers Spirit and Opportunity on the red planet'ssurface. Energyproduction for the Spirit increased almost 12 percent, from 261 to 295 watt hoursper martian day, or "sol," and from 128 to 243 watt hours forOpportunity, a boost of nearly 53 percent. One hundred watt hours is what ittakes to run a 100-watt light bulb for one hour. Before power production wasimpaired by the dust storms, therovers were averaging about 700 watt hours per sol. Opportunityhas managed to fully charge its batteries and Spirit is bringing its batteriesto nearly full charge. Also, the temperature of the core electronics module onOpportunity has risen from a dangerously low minus 25 degrees Fahrenheit (minus37 Celsius) last week to minus 28.1 degrees Fahrenheit (minus 33.4 Celsius). Missioncontrollers responded to the good news by gradually increasing the rovers'science observations. They have commanded Spirit to moveits arm for the first time in nearly three weeks. The robotic geologistwill position its arm's microscopic imager to take a series of photographs oftwo soil targets and one rock target. 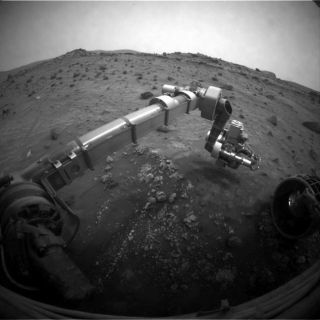 Opportunity,currently perched on the rim of VictoriaCrater where it was supposed to descend before the storms struck, will makescientific observations of the martian atmosphere. JohnCallas, rover project manager at NASA's Jet Propulsion Laboratory inCalifornia, cautioned that the rovers are not fully in the clear yet. "Conditionsare still dangerous for both rovers and could get worse before things getbetter," Callas said. "We will continue our cautious approach to theweather and configure the rovers to maintain a high state of charge on thebatteries. Communication sessions with both rovers will remain limited untilthe skies clear further."